Astronomie - Entangled particles might reveal the interior of black holes A new quantum approach arises to the question of whether information can escape black holes. UFO-Forschung - Is there anything more? Raumfahrt-Politik - Brexit Britain will be lost in space One of the UKs most successful space entrepreneurs has launched a withering attack on Brexit, labelling it galactic scale stupidity. 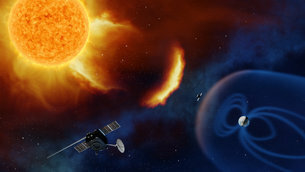 ESA is planning Earth’s first dedicated space weather observatory to warn of potentially harmful turbulence in our parent star. Like a referee at a sports game, the Lagrange spacecraft will be able to observe both the Sun and Earth as well as the space in between – but will itself be in the space weather line of fire. “This will be an operational rather than a scientific mission, meaning it has to keep on working because people will be depending on it,” explains ESA space environment specialist Piers Jiggens. “On Earth it wouldn’t be acceptable to have weather forecasting infrastructure that stops working when a hurricane is coming, because coverage would be lost at the point when an extreme weather event impacts our lives the most. In the same way the heat of the Sun drives weather on Earth, solar activity is responsible for disturbances in our space environment, called ‘space weather’. As well as emitting a continuous stream of charged particles, known as the solar wind, the Sun sometimes produces eruptions called ‘coronal mass ejections’ (CMEs) – expelling billions of tons of material bound up with magnetic fields, often in volumes larger than Earth itself. If these clouds of particles reach our home planet they can disrupt Earth’s magnetic field and upper atmosphere, disrupting satellites in orbit, and electrical and communications infrastructure, potentially causing billions of euros worth of damage. Today’s workhorse solar observer, the ESA-NASA SOHO spacecraft is located 1.5 million km away at the Lagrange point L1, on a straight line between Earth and the Sun, so views incoming CMEs head-on. 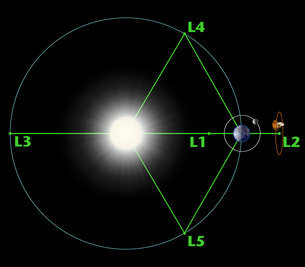 By contrast, the Lagrange mission will be placed much farther from Earth, a hundred times further than SOHO at 150-million km distance, at the third point of an equilateral triangle formed with the Earth and the Sun. Lagrange takes its title from the gravitationally stable locations in the Sun-Earth system, one of which it will orbit around – the fifth Earth-Sun Lagrange (L5) point. These have been collectively named after the Italian mathematician who first theorised the existence of these stable points in space. Sitting at this equidistant point away from Earth and the Sun, Lagrange will be able to identify stormy segments of the Sun’s surface before they rotate around to face Earth, and then track CME clouds as they head our way. 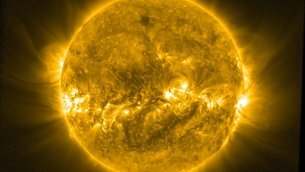 “Just because the spacecraft is not aligned with Earth and the Sun does not mean it will not be affected by the space weather events it will be monitoring,” adds Piers. “This is because the solar magnetic field, which high energy particles follow, is curved because of the Sun’s rotation, a phenomenon known as the ‘Parker spiral’. 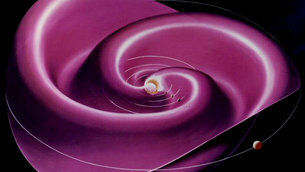 “What this means is that the fastest charged particles from a CME event will reach Lagrange in a matter of minutes after an eruption, potentially causing adverse effects to the spacecraft at just the point it is most needed to resolve the direction and speed of the material headed Earthward, working on a timescale of hours. As is already standard, the spacecraft itself will be built from carefully screened radiation hardened electronic components. Its onboard systems will be equipped with ‘fault detection and correction’ systems to identify and correct for bit flips or other anomalies. For the Lagrange mission, ESA and its industrial partners are investigating how to make these systems more robust still. “For the L5 mission, the spacecraft has to be more intelligent than others, and will need to have a clever failure detection, isolation and recovery strategy,” notes Stefan Kraft, overseeing the mission. On the imaging side, the particles impair the vision of the mission’s highly sensitive instrumentation. Automated onboard systems will apply artificial intelligence to identify and remove false pixels on a frame-by-frame basis. Reduced image exposure time is another solution being looked into to decrease the number of radiation ‘hits’. In addition extra aluminium shielding could be added around the detectors, to prevent charged particles impacting them from the side. The Lagrange mission is currently being developed through parallel industrial studies, to present to Europe’s space ministers at Space19+ at the end of this year. If approved, it will launch by 2025. The US National Oceanic and Atmospheric Administration (NOAA) is planning a solar observatory at L1 with a launch targeted in 2024. This mission would provide data complementing observations from L5. The two missions together would form a combined observation system, offering stereosopic views of space weather events as they occur.